Can you define heavy metal? Does metal mean screaming vocals and deadly distortion? Or is metal wailing guitar solos and an iron lunged singer? To Fang VonKillenstein of Lords Of The Trident, heavy metal is “that distorted sound that makes you roll down your windows in the summer and makes you put your fist in the air, out the window. It just gives you that feeling in the pit of your stomach that just drives that ‘yeah.’” One can only assume that “yeah” would make King Diamond proud. If you haven’t seen Lords Of The Trident, you are assured that Mr. Killenstein isn’t joking you. The Lords are showmen at heart. They strive to bring people into the genre of heavy metal who would typically dismiss it without a second thought. Through the ups and downs of the local scene these guys have really stuck by their guns, and branded their own little piece of the Madison scene and the metal genre. 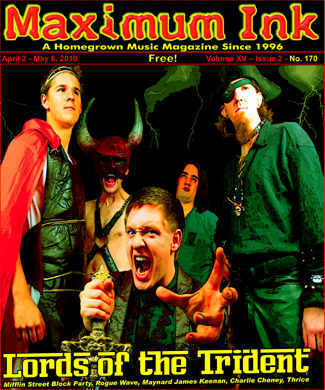 LORDS OF THE TRIDENT will be playing the Blacktooth Metal Family show at The Annex on April 10 and the Mifflin Street Block Party on May 1st, both in Madison. Come out and see the chaos as these guys show off their version of what it means to “be metal”. Epic fire and explosions await weary travelers.